Dak Britt ran for over 100 yards for the second straight game and Adrian Ferns scored twice as the Shenzhen Naja defeated the Dalian Dragon Kings 46 to 30 in the game that decided fifth place in the first season of the China Arena Football League. The Crowd at Shanghai’s Oriental Arena was treated to the Naja running game that churned out 152 yards on 22 carries and three touchdowns between the running of Britt and Ferns. The game began with Shenzhen’s Yu Lan Shen taking the opening kickoff 35 yards to the end zone for the games’ first score. After the Dragon Kings failed to get a first down, the Naja took advantage of a short seven yard field and scored in two plays with Britt getting his 14th TD of the season from two yards away. Dalian climbed back into the game with Jawad Yatim hitting Kent Richardson with a 24 yard strike but the momentum faded as the Naja drove 32 yards in seven plays with Ferns scoring from four yards out and a 20 to 6 lead to end the first quarter. Dalian came out swinging in the second quarter with a nice five play, 33 yard drive with Talib Wise, the third leading receiver in the league, hauling in a 17 yard pass to make it a six point game. Dalian missed a great opportunity to take the game over as its defense stopped the Naja on the next series. The offense drove the ball inside the ten, but on fourth and goal from the nine, they gave the ball back with an incomplete pass. Six plays later Shenzhen closed out the half with Britt firing to Xinhe Xu for his seventh TD reception of the season and a 26-14 halftime lead. The Naja found another gear in the second half. After forcing Dalian to turn the ball over on downs, Shenzhen got creative on a first and goal at the three with Britt tossing a pass to tight end Colin Madison for six. Dalian would not back down as linebacker Ameer Ismail recovered this third fumble of the season and the Dragon King offense responded, converting the turnover into points in the final quarter. On first and ten from the 14 Yatim pitched the ball to Wise who started to sweep around the right end, then he pulled up and floated an option pass to Zhen Ma for a touchdown and the Dragon Kings trailed 32-22. 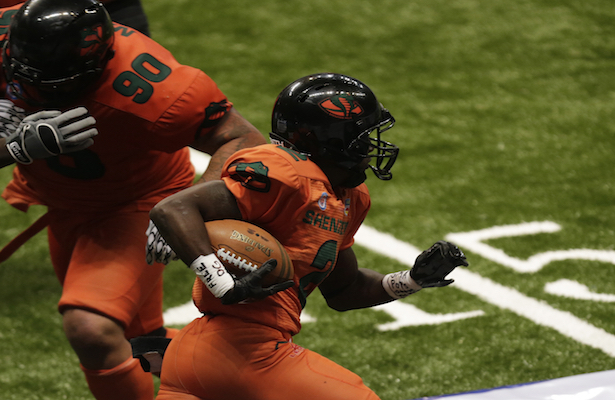 The teams traded scores with Ferns scoring on a two yard run for the Naja and Yatim taking matters into his own hands and running 24 yards for his third rushing touchdown of the season. Dalian would get no closer than nine points as Britt closed the scoring with Shen getting his second score of the game, this time on a 23 yard pass play. Britt finished the game just 6 of 15 passing for 87 yards and three scores while rushing 15 times for 101 yards and a score. He became the first CALF player to have back to back 100 yard rushing games. Britt finished the season with 489 yards. Ferns ended with 240 yards on the year. Yatim was Dalian’s leading rusher with 54 yards on eight carries and one TD. He was also 11 of 29 passing for 172 yards and two scores. Wise led all receivers with five catches for 54 yards and a TD while also passing for the 14 score on the option toss. The Naja finished in fifth place with a 3-3 record while the Dragon Kings ended up 0-6.